Monounsaturated fats are “healthy fats” that can help you lose weight, lower cholesterol, stop inflammation, and prevent diabetes. Replacing the saturated fats with monounsaturated fats (or MUFAs) can help improve your mood and protect against heart disease. Keep reading to learn more about the benefits of monounsaturated fats. Monounsaturated fats intake can reduce the risk of heart disease, help you lose weight, and improve immune function and diabetes symptoms [R]. 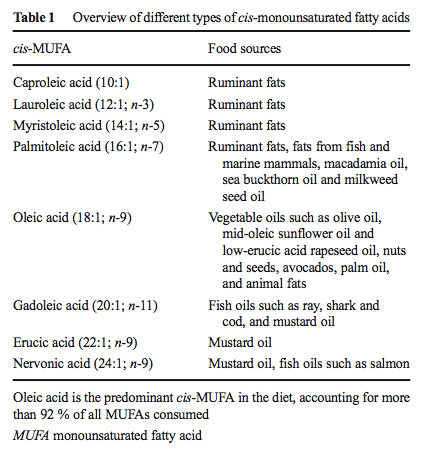 The most common MUFAs in daily nutrition are oleic and palmitoleic acids [R]. Oleic acid, or omega-9, is a non-essential fatty acid, which means the body can create it. It can help control the immune system and benefit our health [R]. For example, olive oil is 70 – 80% oleic acid. Many studies described its health benefits, such as reducing cholesterol levels, lowering blood pressure, reducing inflammation, and protecting from breast cancer [R]. Oleic acid blocks cholesterol absorption in the small intestine. It activates the unfolded protein response pathway and decreases NPC1L1, which is important for cholesterol absorption [R]. Oleic acid can reduce inflammation due to saturated fats in human cells. It reduces ICAM-1, which is part of the inflammatory response, and phospholipase A2, an inflammatory enzyme [R]. Oleic acid reduces the stability of the cell membrane, which increases the activity of a receptor for adrenaline (α2-adrenoreceptor), lowering blood pressure [R]. Palmitoleic acid, also known as omega-7 fatty acid, is present in the blood and in the normal human diet [R]. 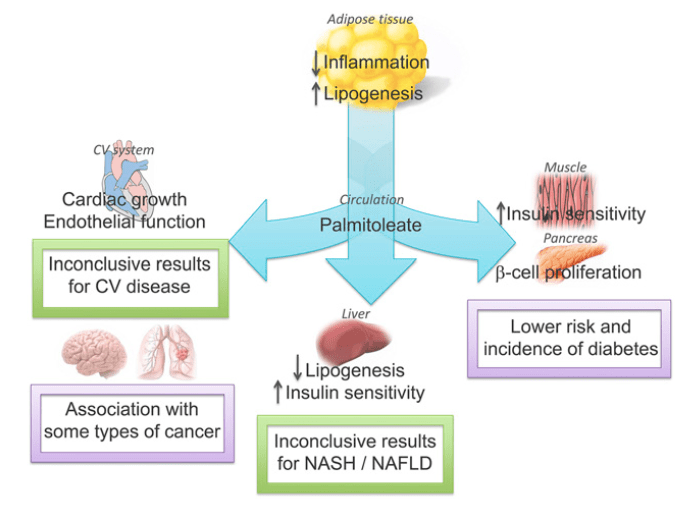 In the human body, palmitoleic acid is synthesized in the liver and fat tissues. Dietary sources include macadamia oil, cod liver oil, salmon, olive oil, chocolate, eggs, dairy fats, and sea buckthorn [R]. There are two forms of palmitoleic acid: cis and trans. The cis isoform is associated with decreased fat accumulation in the liver and increased insulin sensitivity. The trans isoforms are found in dairy products and partially hydrogenated oils and associated with lower risks of heart diseases and diabetes and slightly lower body fat [R, R]. 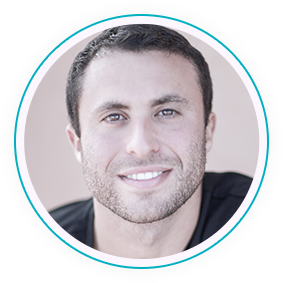 Activating PPAR-alpha, thus promoting fat burning to produce energy [R]. AMPK is an enzyme that activates energy-producing pathways and inhibits energy-consuming ones [R]. It helps prevent cancer and diabetes. At the same time, it also lowers cholesterol and triglycerides. PPAR-alpha is a protein that helps turn on genes (transcription factors) involved in fat burning during starvation or ketosis [R]. Diets high in monounsaturated fatty acids (MUFAs), such as the Mediterranean diet, may help with weight loss [R]. In obese women, a diet high in MUFAs led to more weight and fat loss than high polyunsaturated fat diet or their habitual diet [R]. However, in overweight/obese type 2 diabetics, a high-MUFA diet was as effective as a low-fat high-carbohydrate diet in terms of weight loss (4% of body weight lost), HDL levels, blood pressure, and blood sugar improvements (RCT) [R]. A diet high in monounsaturated fats can help lower cholesterol levels. The replacement of saturated fat with MUFA decreases LDL cholesterol, which is the main risk factor for heart disease [R]. Consuming oleic acid in olive oil helps prevent LDL oxidation and, thus, atherosclerosis (hardening of the arteries) [R, R]. reduce triglycerides and cholesterol levels in people with abnormally high levels (DB-RCT) [R]. Diets high in MUFAs were associated with reduced risk for heart disease, heart attack, and stroke. Oleic acid, olive oil, and Mediterranean diets all help prevent heart disease-related deaths [R]. MUFAs coexist with saturated fatty acids in several food sources. Since saturated fat may worsen heart health, it is important to consume food that contains high MUFA levels and low saturated fat levels [R]. A high-MUFA Mediterranean diet may prevent heart attack-related deaths [R, R]. Diets high in oleic acid can also help lower blood pressure, cholesterol, glucose, and insulin levels, which protects against heart disease [R]. Diets high in monounsaturated fatty acids (MUFAs) may be healthier for diabetic patients than low-fat, high-carbohydrate diets. The Mediterranean diet, which is high in MUFAs, improve glucose control and insulin sensitivity [R]. Overweight/obese type 2 diabetes patients can better control their diabetes with a high-MUFA diet than a high-carbohydrate diet (RT) [R]. In healthy subjects, replacing saturated fats by MUFAs in the diet helped improve insulin sensitivity (RCT) [R]. However, this favorable effect on insulin sensitivity only occurs along with a low total fat intake. Also, the high-MUFA diet had no effect on insulin secretion [R]. In rats, supplementation with fish oil (high in MUFAs) can help reduce blood sugar. It also helps improve insulin function and reduce inflammation, which reduces insulin resistance [R]. Olive oil intake is associated with a decreased risk of developing type 2 diabetes (meta-analysis of 29 RCTs) [R]. However, some other substances in olive oil other than MUFAs may also be responsible for these effects. Oleic acid has various effects on the immune system and inflammation. MUFA-rich oils might have similar anti-inflammatory effects as fish oil [R]. Increase nitric oxide (in rats) [R]. Decrease arachidonic acid and the production of the inflammatory mediator prostaglandin E2 [R]. Decrease E-selectin (a marker of inflamed blood vessels) [R]. Decrease CRP (a marker of inflammation) [R]. Reduce oxidative damage, although this could also be due to other antioxidant compounds in nuts [R]. Monounsaturated fats can help with bone health. High monounsaturated fatty acid (MUFA) intake is associated with higher bone density and lower bone fracture risk. In a study of 187 women, high oleic acid diets were associated with increased bone strength [R]. A higher amount of MUFA compared to polyunsaturated fat in their diets also reduced the risk of bone fractures in elderly patients [R]. By reducing prostaglandin levels and reducing bone resorption (the breakdown and loss of bone tissue to release minerals into the blood), MUFAs prevent osteoporosis [R]. In mice, a high-MUFA diet increased bone thickness and volume in comparison to a high saturated fat and a normal fat diet. In addition, the high saturated fat diet also increased calcium absorption in the intestines, although it was unclear if calcium absorption had any effect on bone mineral density [R]. A high monounsaturated fat (MUFA) diet can help improve mood. The Mediterranean diet is associated with lower levels of depression [R]. 14 young adults who consumed high amounts of oleic acid over the course of 3 weeks reported less anger compared to those in the high palmitic acid group [R]. Thus, replacing palmitic acid (a saturated fatty acid) with oleic acid (a monounsaturated fatty acid) reduces feelings of anger and hostility. However, it wasn’t clear if this was due to increased MUFAs or decreased saturated fatty acids [R]. Consuming monounsaturated fats (MUFAs) instead of saturated fats can help reduce cancer risk. Diets containing oleic acid reduced breast cancer risk [R]. Breast cancer risk and MUFA intake also depend on the food source of the fats. Olive oil is associated with reduced breast cancer risk. However, margarine, a highly processed source of MUFAs, does not help reduce breast cancer risk [R]. Possibly, the anti-cancer effects of olive oil were due to antioxidant content rather than to oleic acid [R]. A Mediterranean diet can help suppress rheumatoid arthritis symptoms [R]. Compared to healthy people, rheumatoid arthritis patients ate significantly fewer MUFAs, suggesting that MUFAs may prevent the disease [R]. In addition, olive oil consumption was associated with a lower risk of rheumatoid arthritis [R]. MUFAs can protect against liver injury due to a drug overdose. In rats, a high-MUFA diet protected against acetaminophen (Tylenol)-induced liver injuries. The presence of monounsaturated fats in the cell membrane of liver cells reduces the cells’ susceptibility to oxidative damage [R]. In addition, diets rich in MUFAs tend to decrease liver fat content, which may protect against nonalcoholic fatty liver disease [R]. 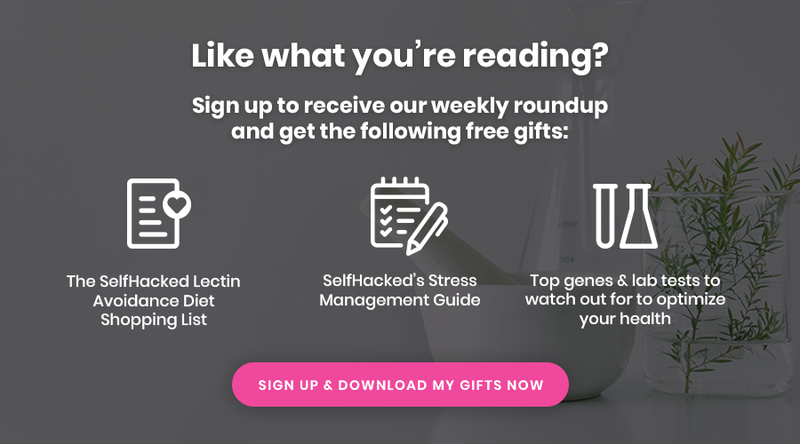 Gut bacteria can lead to obesity and, conversely, obesity can disrupt gut bacteria [R]. An oleic acid-derived compound can help with weight loss by restoring gut flora. Oleic acid reduces a family of bacteria called Enterobacteriaceae, which is associated with inflammation. In addition, it increases good bacteria (Bifidobacteria) [R]. High olive oil intake, which is rich in MUFAs, lowers the risk of severe skin damage from the sun [R]. However, there was no association between MUFA intake from dairy products and meats [R]. Most of these human studies had shortfalls. They were either small-scale and short-term human studies that relied on self-reported dietary choices or large-scale surveys. In addition, some of these health benefits could be caused by antioxidants in olive oil rather than MUFAs themselves. Therefore, monounsaturated fats might not be the true cause of these health benefits. Monounsaturated fats on their own do not have any toxic effects [R]. However, nuts, a good source of MUFA, can cause allergic reactions [R]. Excessive fat intake can increase calorie consumption leading to weight gain [R]. Foods high in MUFA can simultaneously be high in other fats [R]. A high-fat (total fat, saturated, and monounsaturated fat) diet is associated with increased gallstone disease risk [R]. In contrast to oleic acid, uncommon MUFAs can increase the risk of heart disease. 7-hexadecenoic acid and cis-vaccenic acid were associated with higher heart attack (sudden cardiac arrest) risk in a prospective study of 2,890 elderly people [R]. Although MUFA consumption can be the cause of the increased risk, the results of this study are also associated with higher carbohydrate, protein, and alcohol intake. Therefore, it wasn’t clear if MUFAs consumption was problematic [R]. Oils are a natural source of monounsaturated fats [R]. Avocado, macadamia, and olive oils are predominantly monounsaturated fats, while rapeseed, peanut, almond, sesame, sunflower, and rice bran oil contain some MUFAs but are predominantly omega-6 fats. Nuts are a good source of monounsaturated fats [R], especially macadamia nuts. Whole fat milk products (milk, cheese) [R, R]. There are no known drug interactions. However, a high-MUFA diet slightly increased the absorption of dextrose in rat intestines [R]. rs17300539 (-11391G>A): At high MUFA intake, GG homozygotes had higher BMI and increased obesity risk compared to people with the A allele [R]. rs266729 (-11377C>G): Men that are CC homozygous became less insulin resistant with a high-MUFA diet than with a high-saturated fat diet [R]. High intake of monounsaturated fatty acids (MUFAs) can affect people with the PPARγ SNP rs1801282 [R]. PPARγ is a protein that turns on other genes (transcription factor) and is activated by dietary fats. The G allele reduces PPARγ activity [R]. In an obesity intervention study where all subjects ate a Mediterranean diet, GG or GC subjects were significantly less obese than those with CC alleles. However, low MUFA diets did not lead to any difference in obesity between CC and CG/GG [R]. Moreover, CG/GG lost less weight (in % of body weight) with a high fat intake. People with the G allele have a greater resistance to weight gain, but they are also resistant to weight loss [R]. In another study of 538 adults, researchers looked at their dietary intake and physical examination results. Obese people with the G allele that consumed less MUFA had higher insulin resistance. Therefore, MUFA consumption can help lower insulin resistance and diabetes risk in people with the G allele [R]. Increased PON1 activity protects against atherosclerosis. Some fats and antioxidants can change PON1 activity. In male subjects, PON1 activity increased after a high-MUFA meal. In comparison, the high saturated fat diet slightly decreased PON1 activity [R]. However, this was not observed in female subjects [R]. Liver X receptors (LXRs) are proteins that activate other genes that are involved in the transport and breakdown of cholesterol and can also reduce inflammation [R, R]. Oleic acid can increase cellular levels of LXRs in a cell-based (neutrophil) study [R]. A shake with high monounsaturated fatty acid (MUFA) concentration activated inflammatory genes [R]. In mice, oleic acid treatment increases BCRP levels, which is an important transporter for nutrients and drugs, increasing the intestinal absorption of these substances [R]. PPARα activation induces fatty acid breakdown in the heart. In male rats, a high monounsaturated fat diet with sunflower oil moderately increased PPARα gene and protein levels [R]. Additionally, in obese mice, the increase of MUFA content correlated with enhanced ELOVL5 expression [R]. In cell-based studies (bovine cells), oleic acid treatment significantly reduced cellular production from the following genes: FSHR, LHCGR, STAR, CYP11A1, HSD3B1, CYP19A1, and CCND2, and increased CD36 and SLC27A1 [R]. Monounsaturated fats have only one unsaturated carbon bond compared to other fatty acids and have two forms – cis and trans. In cis-configurations, the hydrogen atoms are on the same side of the double bond, while they are on opposite sides in trans-configurations [R]. Trans monounsaturated fatty acids are semi-solid fats present in the industrial processes that partially turn oil into saturated fats (partially hydrogenated fats), such as margarine and shortening. Generally, these are harmful monounsaturated fats that are believed to cause inflammation, heart disease, and hardening of the arteries [R]. One exception to this is trans palmitoleic acid, which is associated with lower total cholesterol, triglycerides, and C-reactive protein. Whereas, the predominant natural form of monounsaturated fatty acids (MUFAs) is the cis form. Simply loved the article thanks for sharing. such a knowledgeable topic.